The United Sates Military is threatening to retaliate against the Iranian-backed rebels that fired missiles at the USS Mason off the coast of Yemen. The Arleigh Burke-class destroyer was reportedly targeted by missiles on Sunday but was able to successfully prevent any causalities, injuries, or damage to the ship by firing counter missiles. The destroyer was reportedly forced to fire two SM-2 missiles and an Enhanced Sea Sparrow Missile (ESSM) to intercept the incoming cruise missiles. 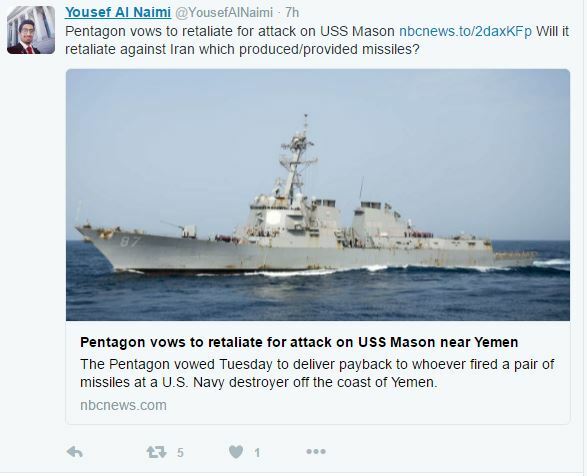 The ship was conducting routine operations at the time when Houthi Rebels, which receive weapons and support from Iran, launched the attack. The Houthis have not claimed responsibility for the attack. Former NATO Leader: "The United States Must Be the World’s Policeman"